We thank You for guiding us once again, as we continue to study the subject of the sanctuary. May our understanding of the symbolic meaning of the sanctuary’s furnishings become a useful instrument that we may add to our toolbox, to better understand Bible prophecy. When I thought to know this, it was too painful for me; until I went into the sanctuary of God. In this second lesson about the sanctuary, we will study the furnishings placed in it. These furnishings hold a wonderful symbolism that we must fully grasp, in order to have the best possible understanding of Bible prophecy. First, let’s review the plan of the sanctuary, showing the arrangement of its furnishings. According to all that I show you, after the pattern of the tabernacle, and the pattern of all the instruments thereof, even so shall you make [the sanctuary]. In our last lesson, we saw that when God indicated to Moses how to build the sanctuary, He showed him a pattern that already existed: the heavenly sanctuary. Not only the tabernacle of meeting but also «all the instruments» were made according to the pattern of the heavenly sanctuary. Let’s now see the furnishings of each part of the sanctuary. In our last lesson, we learned that the courtyard is the name given to the enclosure in the center of which the tabernacle of meeting is placed. Let’s look at these items one by one, with their symbolism. You shall make an altar of shittim wood, five cubits long, and five cubits broad; the altar shall be foursquare: and the height thereof shall be three cubits. And you shall make the horns of it on the four corners thereof: his horns shall be of the same: and you shall overlay it with brass. The altar of burnt offering was used to offer sacrifices for the forgiveness of sins. The services that were performed there will be the subject of our next lesson. You shall make an altar of shittim wood (...). As it was showed you in the mount, so shall they make it. The altar of burnt offering, just like all the other furnishings of the sanctuary, was made according to the pattern of the heavenly sanctuary. But then, what is the use of the altar of burnt offering in the heavenly sanctuary? What is its symbolic significance? And I beheld, and, see, in the middle of the throne and of the four beasts, and in the middle of the elders, stood a Lamb as it had been slain. The altar of burnt offering in the heavenly sanctuary receives the highest sacrifice, the Lamb of God, slain for our salvation. And all that dwell on the earth shall worship [the beast], whose names are not written in the Book of Life of the Lamb slain from the foundation of the world. Neither by the blood of goats and calves, but by His own blood [Christ] entered in once into the Holy Place, having obtained eternal redemption for us. In the earthly sanctuary, the sacrifice of an animal gave access to the other services of the sanctuary. This symbolized the sacrifice of Jesus, which gives access to the other services of the heavenly sanctuary. Having therefore, brothers, boldness to enter into the Holiest by the blood of Jesus (...). And when he had opened the fifth seal, I saw under the altar the souls of them that were slain for the word of God, and for the testimony which they held. The altar of burnt offering in the heavenly sanctuary also receives the blood of the martyrs, who died for their unshakeable faithfulness to Jesus Christ, the Lamb of God. You shall also make a laver of brass, and his foot also of brass, to wash with. You shall put it between the tabernacle of meeting and the altar. and you shall put it between the tabernacle of the congregation and the altar, and you shall put water therein. For Aaron and his sons shall wash their hands and their feet thereat. When they go into the tabernacle of the congregation, they shall wash with water, that they die not; or when they come near to the altar to minister, to burn offering made by fire to the Lord. Now let’s take a look at the laver of bronze (brass), where the priests washed their hands and feet before entering the tabernacle of meeting to officiate. What did this article and its use symbolize? Christ also loved the church, and gave Himself for it; that He might sanctify and cleanse it with the washing of water by the word. Just as the altar of burnt offering is followed by the laver of bronze, we accept Jesus’ sacrifice and then we are baptized, showing by this symbol our choice to receive the cleansing of our hearts through the work of the Spirit within us. Repent, and be baptized every one of you in the name of Jesus Christ for the remission of sins, and you shall receive the gift of the Holy Ghost. «He that is washed needs not save to wash his feet, but is clean every whit.» Baptism by immersion is a complete bath, symbolizing the believer’s justification, the forgiveness of his sins, and his complete regeneration in Jesus Christ. But as we walk the Christian life, our feet become dusty: we then come to Jesus for cleansing. By foot washing, a kind of little baptism, we acknowledge that we always need the blood of Christ. He that is washed needs not save to wash his feet, but is clean every whit. Now we can better understand the words of Jesus: he who is washed (by the washing of baptism) does not need to be rebaptized when he makes a mistake, since he has not lost his faith in Christ. Foot washing is a continuous guarantee of Christ’s cleansing grace. Let’s remember though that baptism and foot washing have no cleansing virtue in themselves: Christ is the One who, through these services, cleanses us. We remember that the Holy Place is the first part of the tabernacle of meeting, whose entrance is made up of a veil. A second veil separates the Holy Place from the Most Holy Place. Here again, let’s look at these furnishings one by one with their symbolism. You shall set on the table showbread before Me always. First, there was the table of showbread, upon which were set the twelve loaves of showbread, replaced every Sabbath. Every Sabbath [Aaron] shall set [the bread] in order before the Lord continually, being taken from the children of Israel by an everlasting covenant. «This is My body which is given for you: this do in remembrance of Me.» Bread symbolizes the body of Jesus Christ, offered in sacrifice for our sins. And why were the loaves of showbread replaced every Sabbath? [Jesus said,] «I am the living bread which came down from heaven. Then understood they how that He bade them not beware of the leaven of bread, but of the doctrine of the Pharisees and of the Sadducees. Jesus also used the image of bread to symbolize the teaching of spiritual things. «To replace the showbread every Sabbath» thus invites us to regularly deepen our knowledge of God and His will. I will send a famine in the land, not a famine of bread, nor a thirst for water, but of hearing the words of the Lord. Let’s feed on the living bread each day, each week, so that we may grow in the grace and knowledge of Jesus Christ. You shall make a candlestick of pure gold (...). Six branches shall come out of the sides of it (...). And you shall make the seven lamps thereof: and they shall light the lamps thereof, that they may give light over against it. Now, let’s see the seven-branch candlestick, used to supply with oil seven lamps burning night and day, giving continuous light to the sanctuary. Command the children of Israel, that they bring to you pure oil olive beaten for the light, to cause the lamps to burn continually. You shall make a candlestick of pure gold (...). And look that you make [the parts of the candlestick] after their pattern, which was showed you in the mount. The seven-branch candlestick was also made according to the pattern of the heavenly sanctuary. [Jesus said,] «I am the light of the world: he that follows Me shall not walk in darkness, but shall have the light of life.» Just like the other furnishings of the sanctuary, the candlestick points to the ministry of Christ, the light of the world, who always enlightens us. For God, who commanded the light to shine out of darkness, has shined in our hearts, to give the light of the knowledge of the glory of God in the face of Jesus Christ. Zechariah 4:2-6: The oil in the candlestick symbolizes the Holy Spirit who enlightens us. Aaron shall burn thereon sweet incense every morning (...), a perpetual incense before the Lord throughout your generations. You shall offer no strange incense thereon, nor burnt sacrifice, nor meat offering; neither shall you pour drink offering thereon. Finally, let’s look at the altar of incense, upon which was burned sweet incense every morning and evening. What is its use, and its symbolic value? And the smoke of the incense, which came with the prayers of the saints, ascended up before God. The Holy Spirit perfumes our prayers, making them acceptable to God. The Spirit also helps our infirmities: for we know not what we should pray for as we ought: but the Spirit Himself makes intercession for us with groanings which cannot be uttered. The Most Holy Place is the second part of the tabernacle of meeting. Let’s look at these items one by one, along with their symbolism. You shall put into the ark the testimony. The ark of the covenant, a chest overlaid with gold inside and outside, contained the two tablets on which God wrote the Ten Commandments. [The Lord] wrote on the tables, according to the first writing, the Ten Commandments, which the Lord spoke to you in the mount (...). I turned myself and came down from the mount, and put the tables in the ark which I had made; and there they be, as the Lord commanded me. And the temple of God was opened in heaven, and there was seen in His temple the ark of His testament. The presence of the ark of the covenant in the heavenly sanctuary testifies to the importance of the commandments of God, which are kept by His people, as we saw in the lesson «The Commandments of God». And there I will meet with you, and I will commune with you from above the mercy seat, from between the two cherubim which are on the ark of the testimony, of all things which I will give you in commandment to the children of Israel. Finally, let’s look at the mercy seat. Used as a lid over the ark of the covenant, it was topped by two cherubim between which God, in the form of a flame (the «Shekinah»), gave His instructions to the high priest. We have not a high priest which cannot be touched with the feeling of our infirmities; but [Jesus] was in all points tempted like as we are, yet without sin. Let us therefore come boldly to the throne of grace, that we may obtain mercy. The mercy seat points to the sacrifice of Jesus, wonderful work attracting the attention of the angels, just like the cherubim on the mercy seat. They did minister the things, which are now reported to you by them that have preached the gospel to you with the Holy Ghost sent down from heaven; which things the angels desire to look into. Moreover the law entered, that the offense might abound. But where sin abounded, grace did much more abound. The mercy seat is placed above the tablets of the law, showing us that by the sacrifice of our sin offering, Jesus Christ, we get the forgiveness of our sins, that is, our transgressions of God’s law. What a wonderful message is contained in Your sanctuary and the furnishings that we find in it! May these furnishings be a continuous source of inspiration, as we progress day after day in our Christian life. May Your grace be with us, this blessed grace that saves us and helps us to do Your will, as expressed in Your Ten Commandments. In Jesus Christ we pray. The test of Lesson 13 is waiting for you! Screen 1: Photo in: «Master Clips 500,000» by IMSI, CD #16, CANA0061.JPG. Screen 2: In: «Revelation Seminars», Seminars Unlimited, 1986, lesson #14 («Dieu a Fixé une Date pour le Jugement»), p.1. Screen 3: Models by GILLESAE, Andrew. 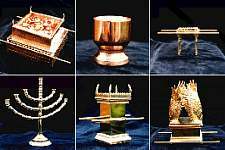 «Altar of Burnt Offerings (BURNT2)», «Laver (LAVER0)», «Table of Shewbread (SHEWBRED)», «Seven-branched Lampstand (LAMPSTD2)», «Altar of Incense (INCENSE2)», «Ark of the Covenant with the Winged Cherubim on top (ARK4)». In: «Bible Picture Library of Photo Art CD», Christian Computer Art, 1998. Table of Screen 3: BOHLMANN, S.E. In: «Revelation 8-11: Trumpets, Tempests and Thunderings in the Temple», G.C. Ministerial Association, 1976. Screen 4: Unknown source. Screen 5: BISHOP, Tom. «The Earthly Sanctuary - Exterior (detail)». In: «New Pictoral Aid For Bible Study» (BREADEN, Frank), Australian Division of Seventh-Day Adventists, 1970, chart #29. Screen 6: Model by GILLESAE, Andrew. «Altar of Burnt Offerings (BURNT2)». In: «Bible Picture Library of Photo Art CD», Christian Computer Art, 1998. Screen 7: Unknown source. Screen 8: DA FIRENZE, Andrea (1333-1392). «The Church Militant», Santa Maria Novella, Florence. In: «Revelation - Art of the Apocalypse» (GRUBB, Nancy), Abeville Press Publishers, 1997, p.130. Screen 9: JUSTINEN, Lars. In: «La Sentinelle» magazine (April 1995), Pacific Press Publishing Association, p.13. Screen 10: MANISCALCO, Joe. In: «Images from the Bible and Sacred History CD», Chosen Works, MLI Software, JM260.BMP. Screen 11: Model by GILLESAE, Andrew. «Laver (LAVER0)». In: «Bible Picture Library of Photo Art CD», Christian Computer Art, 1998. Screen 12: In: «Revelation Seminars», Seminars Unlimited, 1986, lesson #16 («Le Pays du Recommencement»), p.1. Screen 13: REMMEY, Paul. In: «The Bible Story, volume 9» (MAXWELL, Arthur S.), pp.58,59. Used by permission. Copyright ©1957, 1985 by Review and Herald® Publishing Association, USA. All Rights Reserved. Screen 14: BROWN, Ford Madox. «Christ Washing Peter’s Feet» (1852-1856), The Tate Gallery, London. In: «Charlton Heston Presents the Bible», GT Publishing, New York, 1997, p.201. Screen 15: MANISCALCO, Joe. In: «Images from the Bible and Sacred History CD», Chosen Works, MLI Software, JM036.BMP. Screen 16: Model by GILLESAE, Andrew. «Table of Shewbread (SHEWBRED)». In: «Bible Picture Library of Photo Art CD», Christian Computer Art, 1998. Screen 17: In: «The Watchtower» magazine (April 1, 1993), New York, Watch Tower Bible and Tract Society, p.32. Screen 18: In: «La Tour de Garde» magazine (January 15, 1991), New York, Watch Tower Bible and Tract Society, p.7. Screen 19: In: «Questionnaire Adulte de l’Ecole du Sabbat», Pacific Press Publishing Association, First Quarter, 1996, front cover. Screen 20: Model by GILLESAE, Andrew. «Seven-branched Lampstand (LAMPSTD2)». In: «Bible Picture Library of Photo Art CD», Christian Computer Art, 1998. Screen 21: In: «The Bible Story, volume 2» (MAXWELL, Arthur S.), p.165. Used by permission. Copyright ©1954, 1982 by Review and Herald® Publishing Association, USA. All Rights Reserved. Screen 22: MANISCALCO, Joe. In: «Images from the Bible and Sacred History CD», Chosen Works, MLI Software, JM240.BMP. Screen 23: ZINGARO, Charles. In: «The Bible Story, volume 10» (MAXWELL, Arthur S.), p.153. Used by permission. Copyright ©1957, 1985 by Review and Herald® Publishing Association, USA. All Rights Reserved. Screen 24: Cyberspace Ministry, composite picture. 1. «Olive Tree». In: «Collier’s Encyclopedia Deluxe 1998», Sierra Home. 2. Model by GILLESAE, Andrew. «Seven-branched Lampstand (LAMPSTD2)». In: «Bible Picture Library of Photo Art CD», Christian Computer Art, 1998. Screen 25: Model by GILLESAE, Andrew. «Altar of Incense (INCENSE2)». In: «Bible Picture Library of Photo Art CD», Christian Computer Art, 1998. Screen 26: JUSTINEN, Lars. In: «La Sentinelle» magazine (September 1997), Pacific Press Publishing Association, p.8. Screen 27: ANDERSON, Harry. In: «The Bible Story, volume 10» (MAXWELL, Arthur S.), p.156. Used by permission. Copyright ©1957, 1985 by Review and Herald® Publishing Association, USA. All Rights Reserved. Screen 28: MANISCALCO, Joe. In: «Images from the Bible and Sacred History CD», Chosen Works, MLI Software, JM030.BMP. Screen 29: BISHOP, Tom. «The Earthly Sanctuary - Interior (detail)». In: «New Pictoral Aid For Bible Study» (BREADEN, Frank), Australian Division of Seventh-Day Adventists, 1970, chart #30. Screen 30: In: «Revelation Seminars», Seminars Unlimited, 1986, lesson #14 («Dieu a Fixé une Date pour le Jugement»), p.4. Screen 31: Model by GILLESAE, Andrew. «Ark of the Covenant with the Winged Cherubim on top (ARK4)». In: «Bible Picture Library of Photo Art CD», Christian Computer Art, 1998. Screen 32: In: «La Sentinelle» magazine (April 1979), Pacific Press Publishing Association, p.16. Screen 33: STEEL, John. In: «The Triumph of God’s Love, volume 2» (WHITE, Ellen G.), Pacific Press Publishing Association and Review and Herald Publishing Association, 1950, p.398. Screen 34: ANDERSON, Harry. In: «Votre Bible et Vous» (MAXWELL, Arthur S.), Press Publishing Association, p.96. Table of Screen 34: BOHLMANN, S.E. In: «Revelation 8-11: Trumpets, Tempests and Thunderings in the Temple», G.C. Ministerial Association, 1976. Screen 35: Photo in: «Master Clips 500,000» by IMSI, CD #16, SSGP2093.JPG.